Paints consist of four parts: binders, pigments, volatile vehicles and additives. The language of paint can be confusing to the uninitiated. There are many terms that describe essentially the same thing and others are used interchangeably. For example acrylic, vinyl and latex paints are all called water based paints. 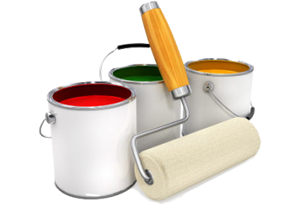 All paints consist of a solvent, however, solvent-borne paint is the name given to oil based paints also known as enamel paints or alkyd based paints. Under the ‘paints’ banner are also polyurethane, 2-pack and epoxy, varnishes, undercoats, sealers, primers, and paint strippers. Finishes of paints can be equally confusing with the terms gloss, semi gloss, high gloss, matt, satin, flat, and low sheen also used interchangeably. Many paint companies use different terms to describe the same thing in order to create a level of ‘uniqueness’ that they can market to consumers. Intellectual Property laws also protect these companies from being specific about the ingredients in their products. Oil based paints are also known as enamel paints or alkyd based paints; whilst water based paints include acrylic, vinyl & latex paints. Listen to my podcast interview on The Good Doctors on the heavy metal lead. The paint industry has seen significant changes since the removal of the heavy metal lead and more recently with the reduction of volatile organic compounds. As Europe tightens its elimination of toxic chemicals through the REACH Regulation, leading paint companies are forced to remove toxic chemicals in order to comply with ecolabels andto be able to continue to sell into the European market. In Australia no such changes are happening and as usual, we are set to become a dumping ground for yet more of these toxic chemicals. This is further complicated by the regulatory system in Australia which allows manufacturers to hide their ingredients under ‘trade secrets’. Nonylphenol ethoxylate (NPE) surfactants are used to harden paint. Concerns have been raised by the fact that they bioaccumulate up the food chain, are highly toxic to fish and shellfish and are known endocrine-disrupting substances (Pharos, 2014). Paint ecolabel programs in France, Germany, Japan, and the European Union prohibit NPE and other alkylphenol surfactants. Triclosan antimicrobials (trade names Microban and Biofresh) are found in antibacterial hand soaps and personal care products as well as in ‘antibacterial’ building materials such as doorknobs, countertops, engineered wood floors, carpet tiles, paints, and wall coverings. Not only is there insufficient evidence to prove these antimicrobial products prevent infection (US Centre for Disease Control, 2003), there are mounting concerns about its adverse health effects as it may cause asthma, is an endocrine disrupter that targets the thyroid gland and it may contain high levels of dioxin residuals – a potent carcinogen. In March 2014, the European Union Standing Committee on Biocidal Products voted to prohibit the use of triclosan in paints which is commonly used in paints made in China and India and then sold in the US and Australia. Nanoparticles have become widespread in paints despite growing concern over the potential health hazards of being exposed to nanoscale materials. Nanoscale materials have been targeted by some big European national paint ecolabels. Germany’s Blue Angel RZ12a and RZ102 and Austria’s Ecolabel UZ01 and UZ17 paint standards restrict nanoparticles in paints. France’s NF Environment 130 program outright prohibits the intentional addition of nanomaterials. Semi-volatile organic compounds (SVOCs) are harmful to human health as they migrate from products onto dust particles which may then be inhaled or ingested. Many cause asthma. The European Union intends to launch a revised EU Ecolabel for Paints and Varnishes that quantifies and limits SVOC content. The new version caps SVOC content at 30 grams per liter (g/l) for white paint applied to interior walls, and 60 g/l for some other applications. Selecting paints and finishes that do not adversely affect indoor air quality and the health of the occupants is an important part of working as a building biologist – a rapidly expanding and exciting growth industry.